Although it does contain four recipes in the back, this book is not a cookbook but rather a primer on food and various ingredients that can be combined to make foods taste even better. The chapters are brief and filled with engaging text and lively illustrations. Readers may enjoy learning about the importance of preparation and gathering the necessary utensils and ingredients before beginning to cook. Although it is easy to eat out nowadays, the author reminds readers that using fresh ingredients grown locally may end up offering consumers a healthier choice. One of the things I liked about the book was how the author considers cooking to be somewhat experimental. Not every recipe will be a success, and not every single word on a recipe must be followed. It might have been nice to have illustrations of some of the ingredients described in the book, and while I liked the encouragement to be creative and experiment, often it is hard to do so when on a tight food budget. If you want a book for kids (maybe 7-12 yrs old) on what food is, differences between organic, free range, free run, how to feel comfortable in kitchen and garden, non-judgemental, educational, fun, this is the book. Assignment:Class 6 - Nonfiction: How To BookTitle:Starting from Scratch: What You Should Know about Food and CookingSubject:A book about food and how to enjoy it.Target Audience: middle school to adults who have no knowledge of foods and cookingPersonal/Critical response: Starting from Scratch is part cookbook, part food textbook, part science review. Because it’s relatively brief at nearly 100-pages, the book appears suitable for all audiences; however, the book has multiple sections which consists of blub-like tidbits or fully developed paragraphs. Thus, parts of the book are too devloped for younger readers -- especially because there are few step 1-2-3… instructions to follow. The book offers readers a heap of content information about food and how to prepare it for cooking. 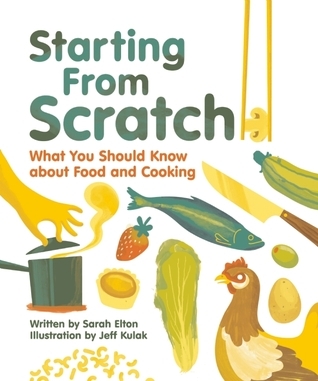 Over the course of six beautifully illustrated chapters, author Sarah Elton digs in to all the info readers need to know about food -- except how to cook it. There’s all the contextual information one could want, but little support after that -- which is where the book let me down. I learned how to do a lot of prep work and how to make informed decisions about the foods I eat, but I didn’t learn much about how to do the rest. The books is like a one-way ticket to the market, but the shopper never gets home. Jeff Kulak’s illustrations are AWESOME, and they are the best part of the book. With that said, I wanted to see pictures in the book. Sadly, it features none. This decision puzzles me. Yes, Kulak’s work is fantastic, but it only reveals so much about the topics covered in the book. Besides the must-have conversion tables and cookware explanations, there’s little about the book that separates it from a dense category of titles in circulation. The brightly colored cover with graphics in shades of green and yellow set the tone for this upbeat, informal, but thorough, book about all things food. Canadian food writer Elton’s breezy text covers the importance of taste and what’s behind it, how food makes us who we are, the science of cooking, the ins and outs of recipes, getting set and using the kitchen, good cooking everyday. The ethics of cooking (religious traditions, sustainability), cooking safety, cleanliness, and even setting the table are included! Elton encourages good cooking everyday and shows it needn’t be complicated. She also encourages trying new foods and cuisines; in that same section she reveals the 5 Cs of cuisine: crop, climate, caravan, and creativity. Using fresh when possible is emphasized, but an evenhanded discussion the “wacky world of flavor science” is included. Food fact sidebars are colorfully sprinkled throughout and there are occasional informational sidebars as well. Appendices covering basic recipes, flavor pairings, measurements and conversions follow the text, as do a few recommended cookbooks and an index. Kulak’s retro-style illustrations complement the lively text, creatively and humorously portraying key elements of the text. There is a lot of information contained within, but the colorful graphics break up the text as well as pull in the reader. A combination of philosophical and practical, the book is highly readable, written in a way to engage tweens and teens--and their parents. I won a copy of this book in the Goodreads First Reads program. This is a book written to introduce children to some basic concepts about food, nutrition, and cooking. It starts with understanding how taste and our senses determine how we experience food and if we like it. It covers tools commonly used in cooking and how to use them safely. It also explains how to use a recipe, replacing ingredients, what flavors work well together, and how to measure everything correctly. The book brings up issues such as: eating local, vegetarianism, eating healthy, budgeting, where your food comes from, and how it is produced or grown. The author does a fairly good job staying neutral on these topics, and just tries to explain what each term means. This is a great way to get children involved in cooking, and understanding concepts that will help them as long as they cook. My one issue with this book is that a few times the words used were almost like baby talk, such as: "thingy" when referring to a tool used in the kitchen. Fortunately, it only happened a few times. There are some simple recipes that the beginner can use to try their new skills with. This is a great book for children learning more about food, cooking, and nutrition. The book is well organized, and uses a one or two page spread to thoroughly explore each subtopic of the chapter. This method makes it convenient for young readers to read only short passages at a time, and finish that concept. Beginning "chefs" will learn a lot from this book about food and cooking. This book is designed to teach the fundamentals to young children, and whet their appetites for more. Because the book explains so much about cooking, it is a great introduction to helping mom in the kitchen. The title sums this one up nicely: "what you should know about food and cooking." It's not a cookbook, but rather an explanation of how to cook, what makes a good meal, and how ingredients work together. I thought it was pretty interesting (disclaimer: I'm an adult reader with not much knowledge about food or cooking... I'm ashamed to admit how often I go out/order in). The layout and illustrations were great and worked well together to make the text more eye-catching and appealing. I think this would be a nice book for an older child or tween who's starting to show an interest in cooking. It's a good book if you just want to know how to flavor and taste your foods but I was under the assumption that it would have recipes and tell you how to make everything yourself. I honestly wouldn't have even entered to win this book if I had known more about it. But if you want to know flavors and smells this books for you. This book looks like a great way to introduce young children to cooking, and healthy food! I look forward to being able to use this with any future children I may have. Or I can use it with my younger cousins. Excellent book for kids interested in learning more about food and cooking. SarahElton Jeff Kulak - Sarah Elton is an award winning and bestselling author and journalist.Sarah has written four books and edited one anthology. Locavore: From Farmers’ Fields to Rooftop Gardens, How Canadians Are Changing the Way We Eat and Consumed: Food for a Finite Planet both explore sustainability and our food.Her latest book is for young people and is titled Meatless? A Fresh Look at What You Eat.The first book she worked on is an anthology of writing titled City of Words: Toronto Through her Writers' Eyes.Visit Sarah online at sarahelton or on twitter @SarahAElton.